Learn more about how helicopters can benefit your agricultural operation in Alabama. Approximately 1,350 aerial application operators call the US home and that number is rising. For almost a century, aviation has been vital in the movement, treatment, and protection of the World’s food supply. 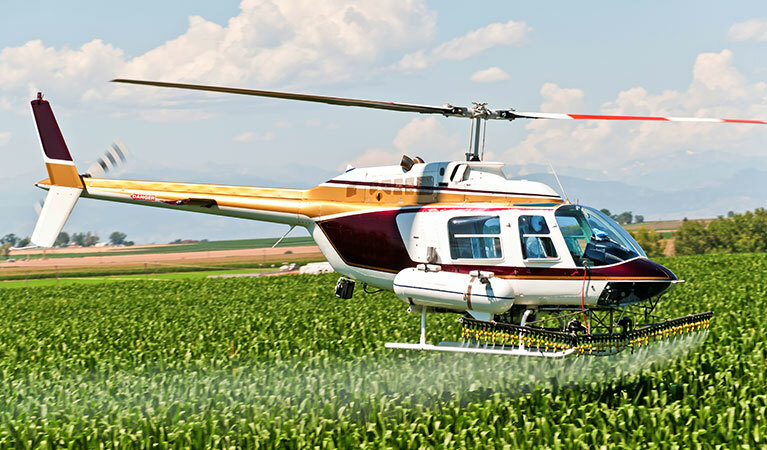 With helicopters, you are given an advantage over those still using fixed-wing aircraft for their crop treatments. Helicopters can access hard to reach areas, can go over uneven terrain, hover, spread evenly using their rotor downdrafts and can be driven to your farm or land rather than have to pay for the transport of the aircraft from the airport. In fact, helicopters are so flexible, you can mix and load chemicals right on the nurse/platform trucks that transport them cutting down on return time for more applications. 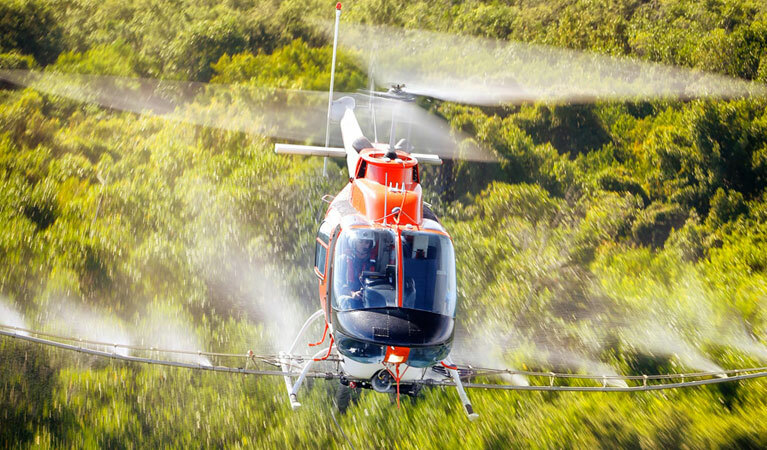 The Robinson R44 and BELL 47 are often used in helicopter aerial applications in Alabama as smaller aircraft can still provide a large amount of spray, are easier to transport and cost less fuel to operate. FairLifts provides options to farmers and growers in Alabama for scheduling spray service as well as some additional services including crop surveys, line inspections and more! The pilots we work with are carriers of both Growsafe and Chemical handler certificates as well as are equipped with DGPS onboard to guarantee precision application. Our ultimate goal is assisting you in production and efficiency with the least amount of environmental impact. More than 43,000 farms on 8.9 million acres spread across Alabama and produce over $70 billion toward the state’s economy. Agriculture and forestry are considered two of the top industries in Alabama and aerial application contributes to 20% of all applied crop protection products on commercial farms and nearly 100% of forest protection applications. With these numbers known it’s no wonder aerial application in Alabama has become so popular for those farmers looking to produce more. Aerial application provides a more precise and completely covered area for farmers increasing efficiency and productivity. 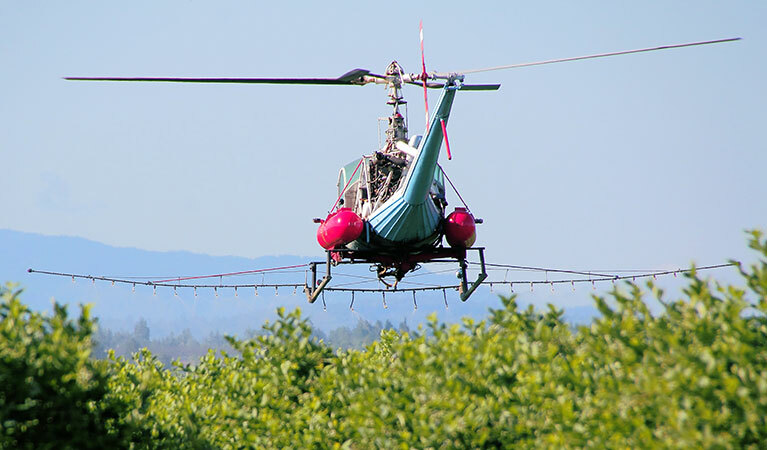 While helicopters are predominantly used in the spraying of crops such as corn, wheat/barley, soybeans, pastures, and alfalfa, aerial spraying can be used on nearly any kind of crop including those most produced in Alabama like Soybeans, Peanuts, Corn and Wheat. From crop surveys to dry and wet spraying, FairLifts can offer you more options for aerial application in Alabama. By using helicopters for your crop needs, you are choosing a more accurate, even coverage for your fields. Helicopters are much faster, have less of an impact on surrounding crops or roads, and provide more penetration of the crop canopy. With so many benefits as well as saving you time, gaining you profit and assisting in production of higher quality products, there is very little else to decide other than when you’d like for the pilot to come to your farm. Take a look at the options below, while these are the most popular we offer customized scheduling for specialized needs as well. Anyone who has been to the South knows that mosquitos are a menace and small insects can wreak havoc on the quality of your crops. Helicopters provide easy access to areas of your fields or land without affecting the surrounding environment and neighborhoods. We work with professional specifically trained in mitigating pesticide drift and spray drift and are knowledgeable of the specific rules and regulations for pesticide treatments in Alabama. Choose from options such as adulticide and larvicide to ensure every pest life-cycle is taken care of. While Alabama is located in a fairly warm region, there is always a chance for frost even during the warmer months. Frost prevention and treatment through aerial application can mean simply drying, or spraying crops with a preventative. Continuous spraying for further into the colder months can be arranged to assist you in keeping your crops from being affected by the cold to guarantee you larger yields and more product by the tail end of the late season. Experts are standing by to get you a fast quote for your agricultural job in Alabama! FairLifts works with the most professional and experienced pilots and operators working in the agricultural aviation industry. Each of our agents is well-versed in assisting farmers in producing higher and better quality yields in Alabama and can assist you in your own growth. Simply contact us seven days a week to discuss environmentally and neighborly crop dusting and spraying this next growing season.